When companies seek clever ways to leverage hot topics and gain some positive public relations in the process, it helps to vet the idea for relevance and the execution for tone. While Bisquick’s product may be yummy, its #PancakesvsWaffles Twitter hashtag campaign lacked taste – and good judgment – all the way around. The obvious reason was timing. It was a week that saw a nominee boast about groping women in the most vulgar terms, and the news media ate it up. The link to the election was also questionable. Even if 2016 weren’t unprecedented for its family-unfriendly content, it’s not a logical association. PR pundits should ask themselves if it’s really intuitive to put pancakes and waffles alongside a political debate, especially in real time. Are breakfast foods a natural link to politics in your mind? No, they’re not. And the public didn’t bite. Almost immediately, Twitter was flooded with pleas to stop the blatant marketing tie-in and begged the question – do you want your wholesome pancake and waffle mix mixing it up with Trump and his crass comments? We understand the lure of real-time marketing and clever hashtag campaigns. Who can forget Oreo’s brilliant “dunk in the dark” tweets during the famous Super Bowl blackout of 2013? Where that campaign was genuine, true to the brand and fun in its spontaneity, the pancake waffle weigh-in was just illogical and offensive. What’s the campaign goal? If it’s “press at any price” and controversy is part of your brand’s DNA anyway, then go for it. Align with the outlandish and don’t think twice. This has continued to work well for Kenneth Cole, who uses his advertising and social media to make provocative statements like the “Boots on the Ground” campaign at Fashion Week. This approach doesn’t work for every brand, however. It pays to conduct some smart strategizing ahead of any such link to a hot topic to weigh out the pros and cons. Will your target audience “get it?” This appears to be the biggest part of the Bisquick fail – no one saw the relevance. Who wants to see a beloved brand catch heat when most are weary of partisan rhetoric and on edge about the whole process? Since Bisquick stands for comfort food that evokes childhood, maybe it should stay in that comfort zone. The brand might be wiser to cook up a campaign that counters the bitter political fighting with something sweet and syrupy that makes us forget about the nastiness. Does the effort have buy-in up and down the organization? We’ve talked before about the importance of selling strategic PR to the C-suite (and other decision-makers) for comprehensive company buy-in. What works best is demonstrating the measurable benefits and ROI to the organization. These would include the obvious PR exposure and less obvious – perhaps engagement of an untapped audience or an opportunity to create a strong advertising tie-in. And don’t discount the personal. For example, we know that the CEO of one our client companies is a weekend musician, so a campaign idea with a music component may strike a chord with him. Can the campaign be executed across platforms? The best ideas are workable across media platforms. Brands like Dove always seem to do it right. It extended the life of this Facebook contest through all manner of permutations on YouTube, Twitter (#Mybeautymysay) and of course, through traditional media relations. The “beauty” of this campaign is how well the brand knows its audience combined with a meaningful message and flawless execution. Twitter alone, by contrast, can be a harsh community, with little room for course corrections. Does the idea have staying power? Some campaigns like these for National Doughnut Day and Veteran’s Day are replicable year after year, but still manage to resonate. In any public relations program, we look for an idea that sticks in the consumer’s mind. 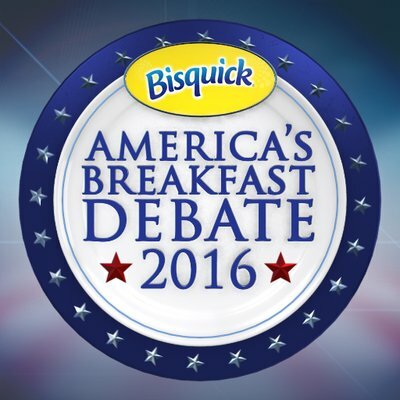 Is there any chance the public will be thinking about Bisquick on Election Day? Odds are no. The current presidential race is so divisive and exhausting that unless you can find a legitimate PR angle related to a bipartisan issue (how about a shorter campaign season?) or a civic call-to-action (a true get-out-the-vote campaign), it’s probably best to turn down the heat and stay out of the politics kitchen until after November 8.